Face the Music gathers forces at Roulette for its annual Critical Mass concert — a performance dedicated to the biggest and boldest new works in the contemporary classical world, all of which are performed by Face the Music’s student musicians. The performance features works written for ensembles and instruments of all shapes and sizes. Highlights of the program include the world premiere of String Vectors by John King, 20 keyboardists playing Empire Drive-In by Deerhoof’s Greg Saunier, and Sean Friar‘s Clunker Concerto — a piece for chamber orchestra and a battery of percussionists playing on hundreds of pounds of junk car parts. The concert will also feature quartets from the Kronos at Kaufman Program, and premieres of student-written works. Face the Music would like to use this program to honor Kaufman Music Center’s beloved Executive Director, Lydia Kontos. String Vectors is a piece conceived as a series of sonic ideas outlining the organization of time. Each player in the string ensemble is a soloist, and performs and interacts with the musical material by themselves making individual decisions in their performance — what material to play, when to begin playing it, how long to play that material, and when to end playing. These choices are made “on the spot” in real time, so that no player knows of or is coordinating with any other player within the group. Within that time, the sonic elements are revealed and bloom and fade organically, and through spontaneity and chance allow the work to unfold. Kaufman Music Center’s Face the Music is the country’s first youth ensemble dedicated to studying and performing music by living composers. Called “a force in the New York new-music world” by the New York Times, Face the Music is a unique youth orchestra: An ensemble and collective music-making program where young and committed musicians use the music of today as a vehicle to explore collaborative decision-making and develop leadership skills. Face the Music features a collection of ensembles including chamber orchestras, a jazz big-band, an improvisation collective, string quartets and mixed chamber-groups. Face the Music is made possible, in part, by The Cheswatyr Foundation, the Eugene M. Lang Foundation, The Patrina Foundation, and the Virginia B. Toulmin Foundation. 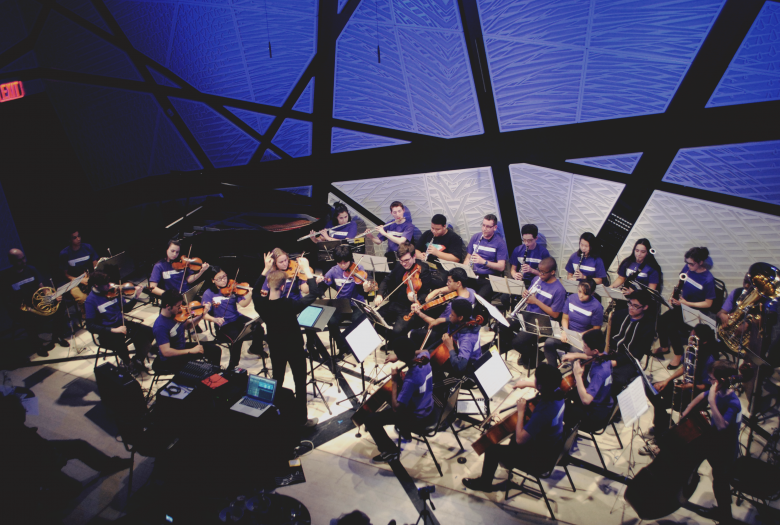 Music education programs at Kaufman Music Center are supported, in part, by public funds from the New York City Department of Cultural Affairs in partnership with the City Council. Face the Music: Critical Mass is a performance of [ROULETTE KIDS], a family-friendly, kid-approved educational programming series that fosters enrichment, curiosity, and wonder through music and the free-play of imagination, experimentation and creative interaction. Support for [ROULETTE KIDS] is provided by the New York City Department of Cultural Affairs.